The knitting industry can be a confusing place. The career of knitting pattern design has changed drastically over the past decade or so, and there aren't a lot of resources to guide us. This is the book I wish that I had had as a novice designer. From self-publishing vs working with a publisher to marketing and dealing with problem customers, this ebook will give you an up-close-and-personal look at the nitty gritty bits of this wild and wooly career. Everything I know about this industry from working both as a designer and an editor/yarn-support-gatekeeper is packed into this 60+ page tome. Bought this within 5 minutes of reading this post. This book is exactly what I need right now! Thank you! I hope it's helpful! Plowed through the ebook already, and it's great! Accessible to a total noob like me, but seems like it would also be a lot use to someone with a few self published patterns under their belt. A really interesting read as well, was sad to get to the end of it! Yay I'm so glad you liked it! It's always nervewracking putting out a new sort of product, haha. The oronjo link is not working for me - I think the problem is on the Oronjo link, but just in case, I'm working on off a Mozilla Firefox browser on a cinnamon Mint Linux computer. I'm so sorry about that, it should be fixed now! It is not working for me either. I'll also be back later, it looks like an amazing resource! link not working for me either. i'm using google chrome. Sorry about that! It has an ejunkie link now instead, which should work. Not working for me either....I'll check back later. Nope, not working for me either, and I am interested! Hi guys, I think it should be fixed now! Oronjo worked for awhile and then poo'ed out so I've replaced it with e-junkie. congratulations! you are something else. I have been looking in on you over the past couple of years and it's so fun to watch how you have grown. Wish I could get in on fun but i'm in nursing school and hardly have time to knit a washcloth. keep up the good work! I'm not getting the oronjo link either, but am using Firefox on a Mac. I can try later on my pc. Tried again this morning on the pc instead of the mac and it worked fine. Thanks! I'm excited to read it! Hi guys, I'm so sorry about that- the Oronjo link was working fine when I went to sleep last night, and then it crapped out on me! I've replaced it with an ejunkie link on another seller's recommendation so it should be working now. Sorry about that!!! Thank you for this! Buying it right. now. Woot! The ejunkie link worked for me. Thanks a billion. It looks great and I can't wait to read through it. You're a star! Alexandra, you rock my world! Look at your knowledgable self being all impressive. Oh snap I clicked through and it's totally Vivian I'm a genius. Love it. This will be a great resource. I am a few days late reading this post, but I bought and downloaded as soon as I did, then devoured the e-book as soon as I got it. I have a few self-published patterns out there but am trying to take things to another level. Your book is super-helpful. Thank you so much! Just finished reading Stacy of Fresh Stitches review and am really looking forward to reading your book. Your book is fantastic - kept reading once I started - thank you for stating everything so clearly and making it easy to follow - so many great tips will be one of my go to books for sure. Thorough, interesting, and well-written. I needed this! Yaaay I'm glad it was useful!! I feel like I'm repeating myself a lot in these comments, haha... thank you everyone!! 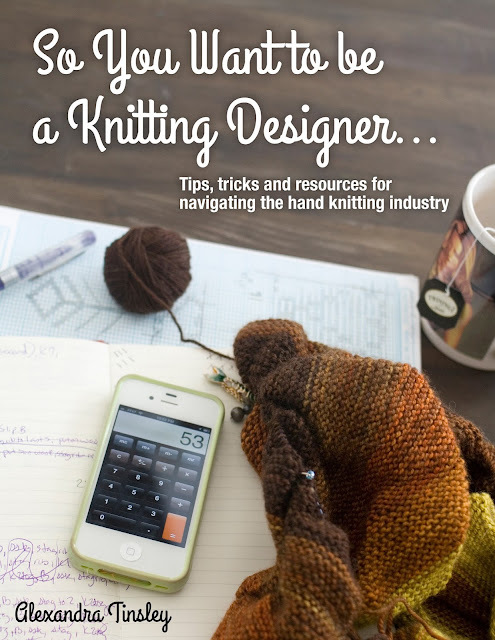 I'm glad to have found out about this resource in the Ravelry Budding Designers forum. I'm looking forward to learning new things. I bought this eBook this morning. I've only had a chance to browse through it in my lunch break but I love it already! I love your writing style, your honesty and the really useful information. Thanks for making this available!